Last update issued on September 30, 2003 at 04:00 UTC. The geomagnetic field was very quiet to unsettled on September 29. Solar wind speed ranged between 275 and 375 km/sec. A fairly weak high speed stream from coronal hole CH60 was likely causing an increase in solar wind speed beginning at ACE at 01h UTC on September 30. Solar flux measured at 20h UTC on 2.8 GHz was 135.1. The planetary A index was 7 (STAR Ap - based on the mean of three hour interval ap indices: 7.4). Three hour interval K indices: 22133221 (planetary), 22121112 (Boulder). At midnight there were 8 spotted regions on the visible disk. Solar flare activity was low. A total of 10 C class events was recorded during the day. Optically uncorrelated flares: C1.8 at 03:59, C3.9 at 05:11, C3.3 at 13:39, C2.2 at 14:07, C1.5 at 16:40, C1.6 at 18:04 and C1.7 at 21:11 UTC. Region 10464 decayed quickly losing nearly all intermediate spots as well as several spots and quite a bit of penumbral area in both the leading and trailing spot sections. Flares: C5.1 at 16:10, C3.8 at 20:04 and C5.4/1F at 21:46 UTC. Region 10466 decayed with the main penumbra splitting into two smaller penumbrae. All small spots disappeared. Region 10469 decayed further during the first half of the day, then began to develop as new flux emerged in the leading negative polarity area. New region 10470 emerged on September 28 and was numbered by SEC the next day. The region developed slowly on September 29. [S264] This region was partially visible late on September 28 at the southeast limb and rotated fully into view with a single asymmetrical penumbra. Location at midnight: S07E72. [S265] A new region emerged in the southeast quadrant on September 29. Location at midnight: S23E24. [S266] A region trailing region S264 rotated into view late on September 29. Location at midnight: S09E82. [S267] This region emerged in the southeast quadrant on September 29. Location at midnight: S18E41. September 27 and 29: No potentially geoeffective CMEs observed. 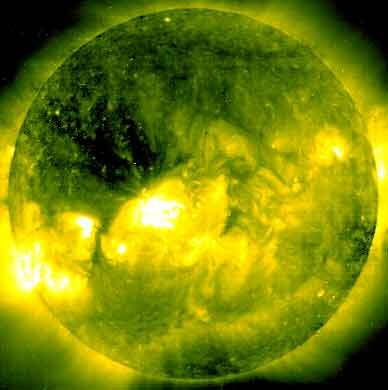 A coronal hole (CH60) in the northern hemisphere was in a geoeffective position on September 26-28. 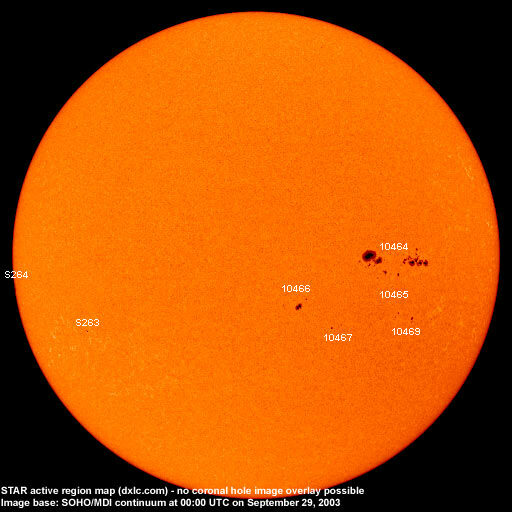 The geomagnetic field is expected to be quiet to active until October 2 due to a high speed stream from coronal hole CH60. Long distance low frequency (below 2 MHz) propagation along east-west paths over high and upper middle latitudes is poor. Propagation along north-south paths is fair. [Trans Atlantic propagation conditions are currently monitored every night on 1470 kHz. Dominant stations tonight: Radio Cristal del Uruguay early on, then Radio Vibración (Venezuela)].